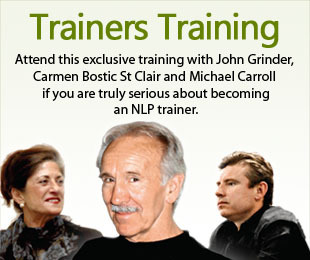 John Grinder, Carmen Bostic St Clair and Michael Carroll formed The International Trainers Academy as a way to ensure that NLP Trainers have the highest standard of training, before offering NLP courses to the public. By selecting an ITA trainer you have the assurance that your trainer has been trained and awarded certification as a trainer personally by NLP co-creator John Grinder, new code co-developer, Carmen Bostic St Clair and Michael Carroll. John Grinder, is keen to ensure his intentions when co-creating the field are maintained and the integrity of NLP is preserved for future NLP generations to be build upon. John Grinder is the co-creator of NLP and one of the greatest thinkers of our lifetime. Carmen is an expert in cultural change, corporate excellence, team formation, leadership models and learning. Michael Carroll is the only NLP Master Trainer in the world certified by NLP co-creator John Grinder and Carmen Bostic St Clair.